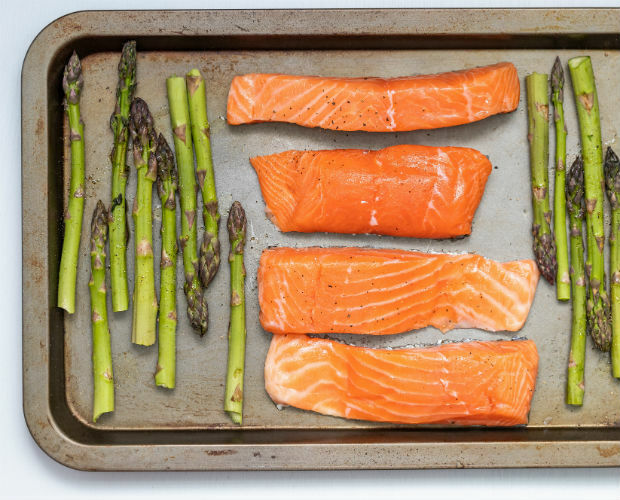 Place your fish filets (or single filet) on a foil or parchment-lined sheet and pat dry with paper towel. Spread a spoonful of pesto (or the sauce of your choice) over each filet, and if it seems thick, drizzle with a little olive oil. Spread with the back of a spoon (or your fingers) to coat the surface of each filet. Sprinkle with salt and pepper. Cook for 10 minutes per inch of thickness, until the edge flakes with a fork but the fish is still moist in the middle. Serves as many as you like. 246 calories, 11.2 g fat (1.9 g saturated fat, 5 g monounsaturated fat, 4.3 g polyunsaturated fat), 88 mg cholesterol, 0 g carbohydrate, 31.8 g protein, 0 g fibre. Originally published in the August/September 2013 issue.